Have you set your goals for 2014? Did healthy eating make it to your list? I'm all about fresh starts and I think now is great time to reboot my system and refocus myself on eating healthier. And better yet, you don't have to struggle with it. Diet-to-Go is a fantastic meal delivery program that provides you with a tasty selection of foods that are sure to help you kick off 2014 with a strong start to eating healthier! 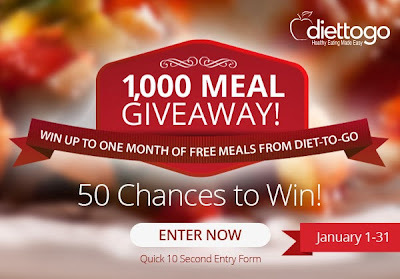 Which is why I'm so excited to announce to you that Diet-to-Go is hosting a 1,000 meal giveaway. Yes. You read that correctly. 1,000 meals will be given away and you get 50 chances to win! That's more than $9,000 in prizes to be given away to help people eat healthier. This is so exciting!!! Have you read my reviews of Diet-to-Go? I'm a huge fan of their meals and I want you to enter. I think you definitely deserve the opportunity to see how awesome they are. Everything has a homemade taste, prepackaged and ready to warm up in the microwave, except for the yogurts, juices, fruit, and jams. I loved knowing I didn't have to think in the morning when getting my breakfast and lunch ready for the day. I just grabbed two meals that looked yummy and off I went to work. Zero prep time, delicious meals, and healthy for me too! On January 7th at 9 pm EST there will also be a twitter party focusing on the Anti-New Year's Resolution: Using common-sense to make lifelong, lasting changes towards health. Join me in this great chat to discuss how it's not about a quick fix. Eating healthy is a lifestyle change. One that can be done easily. Plus, if you join in on the chat, you'll get the chance to win a Fitbit Flex Wristband or a Fitbit scale and three randomly drawn chatters will win a week's worth of meals from Diet-to-Go.